MIAMI TOWNSHIP, Ohio -- The thing about a model home is that it's really a canvas for the imagination. This is what it would be like to live in this community. This is the view my family would have while we eat breakfast. This is what it would be like to have a second-floor laundry room. This is how we'd entertain in our finished basement. This is where we'd have holiday dinners. With homes being finished just in time for school to begin, the first residents are about to move in at the Reserve at Deer Run , a 177-home community being built on the former West Side golf course. 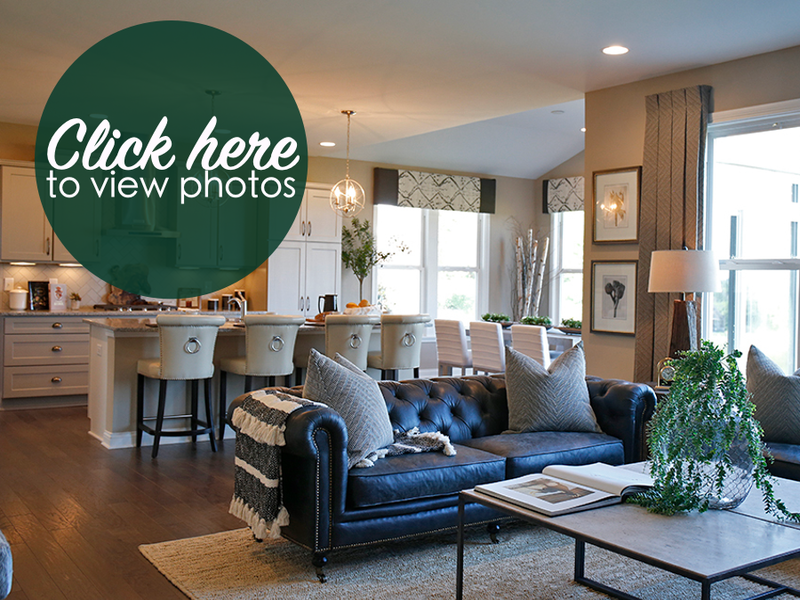 The model home open now on Buckridge Drive offers a nearly endless scope for imagination. The European-style exterior of the 3,100-square-foot home -- 4,000 square feet, if you count the finished basement -- is all steep gables and texture, with a mix of stucco and brick and cedar accents. Homeowners could choose to use the home's floor plan, the Bradford plan , with a Craftsman-style or classic American facade. "You could have these homes side by side and, from the outside, not know they were the same," said Carrie Rogiers, marketing manager for Fischer Homes, the builder at the Reserve at Deer Run. Inside, homeowners have even more choices available. From the light-filled entry, guests can go to the left of the open, cascading staircase, through a door into a window-lined study or through an open arch into the formal living room, which flows into a formal dining room. Taking the arch to the right of the stairs leads you into an open kitchen and family room, with a long, wide island, comfortably seating four. Large windows in the family room look out over rolling, wooded hills. At the end of the kitchen is a "hearth room," with a fireplace centered on a brick accent wall, that serves as a more informal family gathering space. That formal living and dining space becomes, for some homeowners, a spacious guest suite, with a living room, bedroom and bath -- ideal for multigenerational families. And although many families like the hearth room for giving them a cozy nook where the fireplace doesn't have to compete with the TV of the family room, other families choose to omit the hearth room altogether. "We want to let them decide how they want to live in their home," Fischer Homes design manager Dan O'Connell said. "We're giving people the choice to personalize their home to their lifestyle." Upstairs in the model, the master suite includes a garden tub, large tiled shower and a double walk-in closet with a window to let in natural light. The vinyl plank flooring in the master bath looks like wood but is virtually indestructible and easy to clean. Buyers might choose to just have a shower, separate the closets or finish the rooms in different materials. A hall bathroom serves three other bedrooms, each with its own walk-in closet. A door separates the vanity from the toilet and shower to make it easier for multiple people to get ready at once. Homeowners also could choose to add a third bathroom attached to one of the bedrooms or make the hall bathroom a Jack-and-Jill bath connected to two of the bedrooms. All of the rooms, including the airy second-floor laundry room, feature big windows that were intentionally left uncovered in the model home. "We try to provide for lots of natural light," O'Connell said. "It makes space feel bigger, makes it feel more animated, more connected to the outside." The Reserve at Deer Run, expected to be built over the next 10 years, will include 100 acres of green space, with walking trails and a community garden. Most home sites, like the model, will have views of woods and valleys, but some will offer Ohio River views. The community is about 25 minutes from Downtown and is near the Anderson Ferry. The first phase of building includes 22 homes. Typically a homebuyer can go from choosing a home site to moving in within six months, Rogiers said, though the time can vary depending on permits, weather, and, of course, how quickly people make decisions about what they want their house to look like. "It's how much you want to put into customization," Rogiers said. There are the big decisions to be made -- what floor plan, what exterior, guest suite vs. formal living room and dining room, hearth room or not, etc. -- and then many smaller ones -- about lighting, flooring and other details. "You might look at 15 different shades of white and think, 'Oh my gosh!' That's where our design center folks come in," O'Connell said. In the model home, T.O.B. Designs used a mix of industrial and classic styles with neutral colors. The result is a welcoming blank slate. It's easy to imagine a family gathering around the kitchen island and hearth room or a group of teenagers flopped on the wide-seated coach in the basement playing video games. A parent who works from home might see himself taking conference calls in the study while the kids watch a movie in the family room. And wouldn't laundry day be easier if you didn't have to run up and down two sets of stairs to get to the washer and dryer? Standing at the kitchen island, in the middle of the peaceful open space, you can imagine you're home.